For any home, the specific pipe system in place can take into consideration a number of different factors. The option between cast iron pipes and PVC pipe can be related to things like the age of the home, the financial resources available to the homeowner and the geographic location of the home itself. The choice for many people in this department can often be to go with PVC pipes. That’s because they’re made of strong plastic, which is much cheaper than the choice of cast iron. However, because things like fittings, hanger spaces and expansion joints related to the PVC pipe itself, the cost can sometimes come closer than expected to cast iron. In a matchup of iron and plastic when it comes to longevity, iron always has the upper hand. Most homes that were built before the 1960’s will only have cast iron pipes, with some older homes having them still in good working order roughly 80 to 100 years after the residence was first constructed. Repairing cast iron sewer pipe is less frequent, which means that the money that might otherwise be invested in keeping them running can be used for other things. One negative for cast iron is that they can be prone to rust, which may not be evident if regular maintenance isn’t conducted. That’s going to require having someone handle repairing cast iron sewer pipe for your home. The prospect of a fire in a home with PVC pipes can not only result in PVC pipe repair but full replacement. That’s because plastic can offer little protection when being in the presence of such heat. In contrast, there won’t be any need to repair cast iron pipes because they’re fire-resistant. Another issue when it comes to fire is that when that plastic burns, it ends up emitting fumes that can be dangerous to breathe for anyone who unfortunately happens to be in a home. 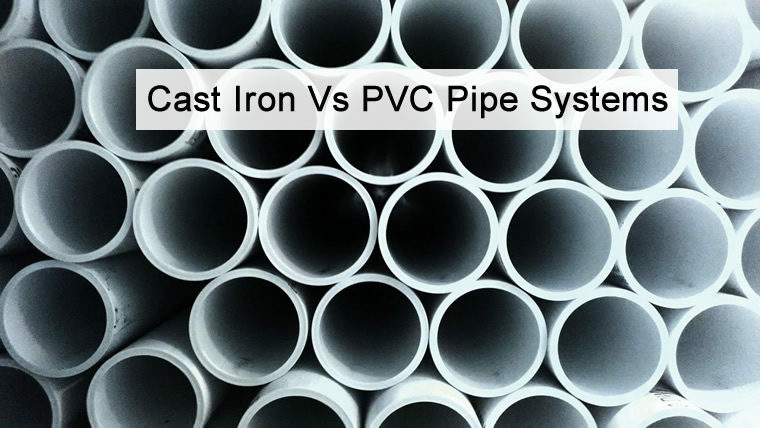 One of the biggest complaints when it comes to PVC pipes is that the noise from them is much more pronounced than with cast iron models. In the latter case, the chief reason for the much quieter atmosphere is because of the thickness of the pipe involved, which offers a little more serenity for a homeowner. That’s not something that will occur with PVC pipes, where the running of a faucet, the turning on of a shower or the flushing of a toilet can be heard through the walls every time. That can quickly become an annoyance, especially for someone who plans on staying in their home for an extended period of time. In reality, this category isn’t the most important for most people. Still, it’s important for anyone considering the installation of PVC pipes because they have the different color varieties being with the different issues. For example, white pipes will inevitably collect dirt much more quickly, while other options can either streak a wall or simply deliver an annoying drip. For those who keep a close watch on their environmental footprint, cast iron pipes would be the choice. The reasons are because PVC pipes are made with oil-based products.and any PVC sewer pipe repair usually discards the material into the trash. Meanwhile, cast iron pipes can be created from scrap iron. 7 Signs You May Have A Sewer Leak! Is It Time To Replace Your Home’s Plumbing? What Are The Benefits Of Trenchless Sewer Repair?